In addition to heartburn, acid reflux can cause pressure or tightness in the chest, with pain that can range from dull to excruciating. 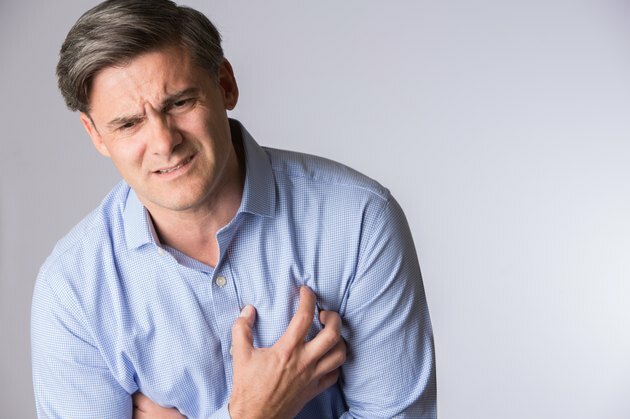 In some cases, these symptoms may be impossible to distinguish from those of a heart attack or cardiac chest pain, which is why evaluation by a doctor is so important. When such symptoms are not due to a heart problem, gastroesophageal reflux disease, or GERD, is the most common contributing factor. GERD can lead to chest pain and pressure through its effect on the esophagus -- and in some people, the windpipe and lungs. GERD-related chest symptoms may manifest as a squeezing or burning pain below the sternum, which may radiate to the back, neck, arms and jaws, mimicking cardiac chest pain. Exactly how GERD causes chest pain isn’t well understood. Exposure to gastric acids may sensitize nerves around the digestive tract, triggering pain signals in response to otherwise normal stimuli. Other possibilities are that exposure to acids trigger chest pain by causing the esophageal muscles to contract, or by causing the esophagus itself to go into spasm, though there is some controversy about the latter as a cause. Acid reflux occurs when digestive liquids leak from the stomach into the esophagus because of weakness in the muscular valve that normally keeps the stomach’s contents down below, where they belong. In some cases, stomach acids splash high into the throat, where they may enter the lungs through the windpipe, exposing the lungs and airways to acid. This is called aspiration, and it can cause or aggravate respiratory problems like chest tightness and chest pressure. The link between acid reflux and asthma, a chronic inflammatory disease of the lungs, is well-established. Acid reflux contributes to worsening asthma and may actually bring on new cases of asthma. Typical symptoms of an asthma attack include wheezing, coughing and difficulty breathing. It's not known exactly how acid reflux acts to aggravate asthma, but it is thought that the acid could stimulate or nerves in the lungs and airways, causing spasms of the airways and mucus secretion. In addition to wheezing, people with asthma may experience chest tightness, pressure or pain with an attack. For some, acid reflux may be directly to blame; for others, acid reflux is indirectly involved. Many people have both GERD and heart disease, and each condition may be confused for the other. Pressure or pain in the chest could be a sign of heart-related pain, and therefor should be evaluated by a doctor. For known GERD-related symptoms, lifestyle changes that may help include elevating the head of your bed, losing excess weight, avoiding foods that seem to set you off and not eating too close to bedtime. Acid suppression therapy with drugs called proton pump inhibitors, or PPI, have a role in the treatment of non-cardiac chest pain from GERD as well as GERD-related asthma. Can Acid Reflux Cause Sinus Pain?